Subwoofer Speaker Size 5.0". 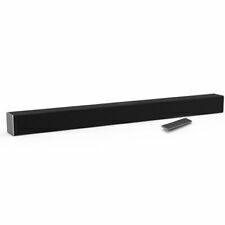 Sound Bar Size 32". Sound Pressure Level 98dB. HDMI ARC Yes. Subwoofer: 1 x subwoofer driver - 6.3. center channel speaker, main channel speaker, subwoofer. full-range driver, subwoofer driver. Center channel speaker: 1 x full-range driver - 2.56". SPEAKER SYSTEM. 1 x bluetooth Soundbar Speaker. - bluetooth Connection. Interface Type: bluetooth. bluetooth Protocol: 4.0. Sound Box Effect: Virtual Surround Sound. Charging Mode: External Adapter. 1 x Power Cable. 1 x AV Cable. Model: BFS425. beFree Sound 5.1 Channel Surround Sound Bluetooth Speaker System in Black. This speaker system is sophistically designed, featuring a sleek look and smooth sound. S/N Ration:≧75dB. Separation:≧50dB;. This speaker system is sophistication and style, featuring a sleek look and smooth sound. 5.25" amplifier x1 3" speaker x 5 output power: 30w 10w 5 frequency response: 40hz-20khz, separation:≧50db, s/n ration:≧75db . 1 Subwoofer Speaker: 5.5" x 10.75" x 11". It utilizes a digitally tuned wooden enclosure for increased bass response. Built In Bluetooth Receiver. Pro Surround Function. OnlyFactoryDirect is an authorized Acoustic Audio dealer. Features NFC and Bluetooth connectivity. Left and Right Rear Speakers. Only accessories listed as included will be supplied. Due to size and weight, Alaska, Hawaii and PO Boxes are excluded. All Speakers. 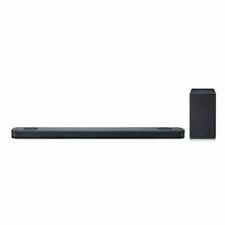 VIZIO SB3251 Sound Bar 32" 5.1 System with remote. Soundbar: 32"W x 3.0"H X 3.0"D. Hear crystal, clear dialogue and thundering bass. Bluetooth compatible so you can stream music from your smartphone or other music player in high quality, too. You can also connect to this system using the built in Bluetooth receiver. It utilizes a digitally tuned wooden enclosure for increased bass response. 1 Subwoofer Speaker: 6.7" x 12.3" x 13.1". Built In Bluetooth Receiver. HDR and 4K video pass-through via HDMI. 6-1/2" woofer. add optional Samsung SWA-8500S wireless speaker kit for full surround sound. SAMSUNG HWQ60R/ZA. slim sound bar fits below most TVs on a stand. built-in Bluetooth for wireless music streaming from compatible smartphones, tablets, and computers. BeFree Sound 5.1 Channel Surround Sound Bluetooth Speaker System. The beFree Sound speaker system with Bluetooth wireless technology features 5 built-in high-powered speakers and easily connects to your Smartphone or other Bluetooth enabled audio devices. VIZIO SB4551-D5B SmartCast 45 Inch 5.1 Sound Sound Bar ONLY!!!! Fully tested ,works good Whats Included. Frisby FS-5010BT supports Bluetooth 5.1 technology for streaming audio wireless from devices that are Bluetooth-enabled. For other non-Bluetooth devices, there is a 3.5mm auxiliary input ports. You've got full power to fill your room with big, balanced sound. CANCELLED IN SHIPPING!!! SHIPS FREE AND FAST!!!! Trending at $554.99eBay determines this price through a machine learned model of the product's sale prices within the last 90 days. BigTechLiquidation Cosmetic condition: ---Sub has visible scratches, scuffs and chipped side ( Please see pic # 5) ---Speakers and soundbar have some minor & visible scratches Functional condition: ---Tested. Fully Functional. 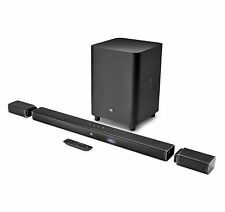 Included: ---Soundbar ---Subwoofer ---2 rear speakers ---2 generic power cords for sub & soundbar Not Included: ---Box ---Manual ---Remote ---HDMI / optical cables or any other cords! ---Any Other Accessories. Our Policies: Payment: Tax Policy: ⦁ Buyers from Ohio state will be charged 8 % sales tax. Shipping and delivery details: ⦁ Make sure that shipping address is correct and matches address provided by Pay Pal. ⦁ We DO NOT ship to APO, FPO or PO BOX address or military bases. THOUGHT I COULD USE THESE BY THEMSELVES BUT I GUESS THEY WORK OFF THE SUB/SOUNDBAR TO ADD REARS TO YOUR SYSTEM. HAVE NOT BEEN USED. The 5.1 input takes up the surround sound of DVD players and BluRay players. LIMITLESS: Via the USB port and SD card reader, the 5.1 surround sound system communicates with portable MP3 storage devices, such as USB sticks and SD cards. 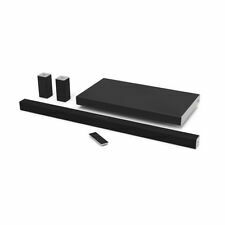 VIZIO - SmartCast 36" 5.1-Channel Soundbar System with 5" Wireless Subwoofer and Digital Amplifier - Black. VIZIO SmartCast 36" 5.1-Channel Soundbar System. Three-speaker enclosure. 5.1 surround sound with Dolby Digital and DTS decoding HDMI input and output, USB input, Toslink optical digital and RCA inputs Three 1.89 x 3.54" full-range drivers. Trending at $470.00eBay determines this price through a machine learned model of the product's sale prices within the last 90 days. 1 x Subwoofer. Item must be in original condition it was received not used or altered in any way with original box and accessories. New from an open box. No instructions are included, but they can be found online. Outputs 1 HDMI. Bluetooth music streaming. Fits seamlessly along most HDTVs for a streamlined look. Sleek appearance. 4 " amplifier x 1 " speakers x5 output power: 20W 5w 5 . this speaker system is sophistically designed, featuring a sleek look and smooth sound. This speaker system is sophistically designed, featuring a sleek look and smooth sound. 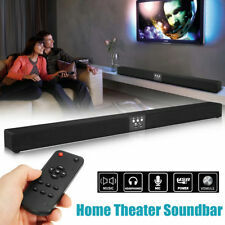 The soundbar is used and does not include the subwoofer, remote or other accessories. The item is in good condition with minor wear from previous use. We are unable to test the soundbar due to the missing power cord but the item is expected to function as intended with no issues. Manufacturer: Monoprice Inc. The subwoofer is housed in an attractive black wood cabinet t, covered by a black cloth speaker grill. When connecting the unit as part of a 5.1 system, these would be taken off the Front Left and Front Right outputs in parallel to the standard pair of front speakers. Select 8-inch 200-Watt Subwoofer Get big sound at the low end by adding this Select 8-inch 200-watt Subwoofer to your existing audio system. 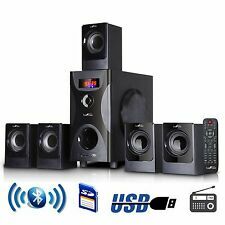 Enjoy deep, rich bass in music and experience the room rattling rumble of explosions when watching movies. Featuring a forward-firing, 8-inch paper cone driver, this sub can be easily integrated into almost any existing audio system. Use the dedicated LFE subwoofer input if your amplifier is equipped with an LFE output or use the line level or speaker level stereo inputs if it doesn't. 6 surround speakers: subwoofer, front left and right, rear left and right and center. 5.1-channel virtual surround sound. Cloth speaker grill. RCA stereo audio inputs. AC power: built-in AC power cable. B&W 5.1 Surround Speaker System with (4) LM1 Bookshelf Speakers, (1) VM1 Center Channel, and (1) AS1 Subwoofer. Manuals included. Condition is Used. Model BVD e2100. From the bedroom.Rarely used! NFC (Near Field Communication) technology removes the need for wired connections and complex setup sequences. Simply touch your NFC-enabled smartphone or other device to the on-body N-mark and start your music. Ported, down-firing subwoofer. Subwoofer: 27 watts RMS. The rest of the system is required for proper operation. You’ve got the flexibility to set up your system the way you want to. Warranty information can be found at the bottom of every product’s page. 1-Active Sub Woofer SA-WP780. Sony 5.1 Surround Sound Speaker System Sub-woofer and Kenwood 100 watt Receiver SA-WP780 P900P680. Sony 5.1 Surround Sound Speaker System. 1-Center Channel Speaker SS-MSP900. Trending at $93.91eBay determines this price through a machine learned model of the product's sale prices within the last 90 days. 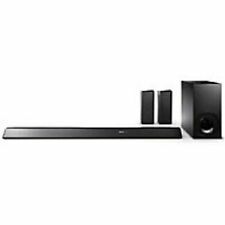 Sony Home Theater 5 Speaker System w/Sub 1000W Free Shipping!